Dallying In The Dirt, Issue #217--- It must be spring tulips are glorious. On my early morning wander through the many delights of spring that are very evident in the front yard, any memory of last autumn’s backache was completely eliminated. Each spring the colour blast from my bulbs just gets better. 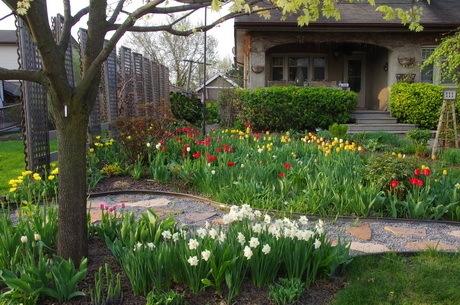 As I drive around various residential neighborhoods and see the plain green and brown yards I wonder how all of those home owners can resist the fabulous rewards that come from a hour or two of bulb planting in the fall. I realize that not everyone is as addicted as I am but how can anyone fail to appreciate and marvel at the dazzling display of colour all of those Tulips create. Now my big decision is which of the many photos I took this morning should I share with you. Spring and the intense gardening season is truly upon us. As I told the Assistant Gardener at breakfast, my wander through the garden showed me dozens of delights and maybe a few items that need attending to. A few of the dwarf Iris are starting to bloom, reminding me to order the Nematodes that will easily take care of the nasty Iris borer. All of the early seeds, Peas, Spinach, Swiss Chard are popping out of the soil and the little fence continues to keep them safe from the attack of the rapacious rabbits. This week I will have to gird my loins and fence the other portion of the vegetable garden. I can safely plant the Potatoes there but the Lettuce that will grow between their rows may prove to tempting to those hungry hordes. Our own hungry horde continues to savour the delicious Asparagus. There are so many wonderful rewards for our efforts that it’s difficult to remember that there was work involved. Sometimes a little more effort and a little more money produces a much better result than we can get by taking the easy and inexpensive path. In gardening as in many things, we usually get what we pay for. I have just spent the time and money to mulch the Hosta bed beside the deck. I dislike most mulches because they are not evenly sized. The small bits disappear the first year and you are left with hunks of wood on the soil. Coconut shell mulch is far superior but it can be difficult to find. The Home Hardware chain does sell it. It comes in a compressed block that must be soaked in considerable water to make it loose and useable. I don’t just wait the 30 minutes or so for it to expand but I have two jobs going at the same time. I throw a block of mulch in the wheelbarrow with the water and then go back to whatever other chore I’m working on. Return to the decompressed mulch and spread it on the garden and then repeat the process with the next bale of mulch. Once on the bed, it decomposes very slowly and is quite consistent in particle size. Many people don’t like the bit of effort involved and the retailers don’t really like it because of its durability, you won’t be back to buy more next year. Look for it and help create the demand. It looks glorious and it will keep my Hosta comfortable and weed free for several years. Bonus, I also got the other job completed at the same time. This picture shows many things if you look at it with a careful gardener’s eye. 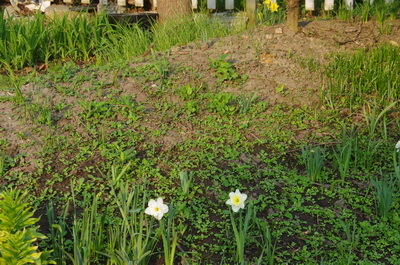 This is the berm at the back of the yard that is being very slow to reveal the 250 new Narcissus that were planted in it last fall. It shows me a chore that I must attend to quickly. It is covered in little seedling weeds. They are very easy and quick to hoe out if they are attacked at this stage. If I wait another week or so it will mean pulling each weed individually. I didn’t want to hoe before I could see the Narcissus shoots so that I could avoid cutting off their tops. Many of them are now slowly appearing and that’s something else that the picture reveals. The bottom of the berm looks nicely moist while the top looks very dry. The Narcissus are doing much better in the moist lower portion. After I do the weeding I need to put a soaker hose along the top half to give those reluctant Narcissus the boost that they need. A nice soaking rain would be much appreciated. Of course, if I hoe down those weed seedlings and then apply the water, there is a good chance that I will replant and encourage some of those weeds as well. I’ll just have to make sure that I get them thoroughly separate from the soil. If you look in the background you will see some lush green foliage. Why can’t I be happy with what Mother Nature supplies. That is the wild orange daylily that came with the property many years ago. I dug, or thought I dug, all of it out last year when I was cleaning up for the wildflower garden. Apparently I missed a few bits of root. I have all of these nice new wildflowers that I want to plant back there. I hope they flourish as well as those daylilies. Barbara Asks? A friend last July gave me 20 everbearing raspberry plants. We prepared the bed in full sun 30 x 11 ft. 2 rows 6 ft. apart Planting with peat moss and watered regularly and added manure around each plan in the fall. Only about 1/2 are showing signs of life, but am hoping some of the others will come along . Do you recommend tilling around the patch every year? I also was given 14 bags of maple leaves. Would you recommend the leaves as a mulch around the plants.? Ken Answers! Only about half of my Rasberries have shown up so far this year. They are usually very hardy so I am in "wait and see" mode. The leaves should make a good mulch but I would put them in a row on the sidewalk or some place and run over them with the lawnmower to break them up into smaller particles. I don't till my raspberries much, just pull out a few weeds and keep them mulched. Heather Asks? Just wondering about white grubs in my potato patch last year. They bored and ate their way through half of my crop, and as I was planting this year I saw and killed some more. Anything I can do to see that I get a bit of a reward for all my labours?! Ken Answers! Beneficial nematodes may be the answer. Check the link in the first paragraph to find a great Canadian source for these helpful little creatures. There are certainly similar sources in the U.S.